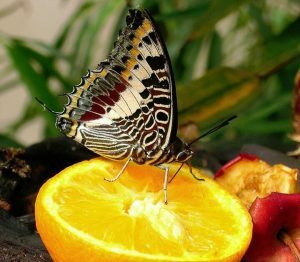 All variations of both the bee and butterfly are severely on the decline. An issue rife across the whole of the UK. With this years Epically hot summer still on high burn. Our little six legged friends could do with as much help as possible to stay hydrated and fully energised through the heatwave. Here’s a quick, fun way to help make your garden, yard or balcony a happy haven for these vital pollinators. By going all ‘Do It Yourself’ and making your own bee and butterfly feeder. For as long as I can remember my parents have kept bees and so the importance of looking after them and other garden fauna has always been at the forefront of my mind whenever I start to cultivate a ‘green space’ no matter how big or small, something I really want to instil in my own kids. A really good first introduction to this is using sensory play and don’t worry it need not be costly! 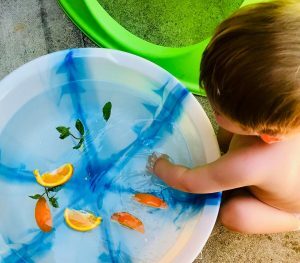 Fill a laundry bucket or paddling with cool water and chuck in some sliced oranges and crushed mint leaves (feel free to use any fresh herbs and fruits you have). 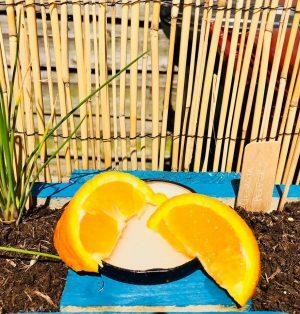 Not only will it help the kids stay cool and smelling positively divine, the textures, scents and tastes are all great stimulators and nature based conversation starters, especially if the ingredients you use are your own home grown produce. Don’t worry I know it looks like I’ve digressed but I’ve not forgotten about the bees and butterflies. Once you and the kids are done playing, squishing, sniffing and splashing don’t throw the fruit away. Take an old jar lid, place it some where high up and shaded and fill it with water. Add a tea spoon of honey, syrup or sugar and top with the sliced oranges from your home made sensory pool. This way nothing goes to waste an you now have a cheap as chips feeding station. Remember to change your fruit and water daily and take in at night so as to not attract any unwanted nocturnal attention! If your a home educator or looking for a project for the kids this summer why not read up on how to attract a whole variety of butterflies to your garden. Or better still take a trip to The Hive at Kew Gardens, a unique, multi-sensory experience designed to highlight the extraordinary life of bees. Aw thank you! 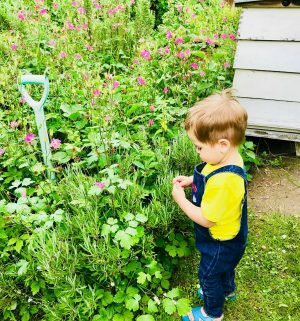 All credits for that specific pic go to https://insteading.com/blog/how-to-attract-butterflies/ an amazing write up on butterfly watching and attracting different kinds of moths and butterflies… Theons really loving the garden and the weather has been perfect for nature projects. I’ve actually started doing the same for myself by adding some of the herbs to my bath, once a week – really good for relaxing…if you can catch a 5 minute break!!!!!! We went to Kew Gardens this year and loved “the hive” such a great idea and fun to experience, so magical how all the lights and sounds you see/hear are triggered by activity in a real beehive. Our little boy loved it inside, all the sensory side. Then also a very tranquil experience as an adult. We are hoping to get our garden all set up for next spring/summer, so are little one can start learning to grow, the flutterbys are very important to us too and we already have little becomes dotted around the garden. We will have to use your ideas for feeders in the garden now too 🙂 thanks. Great read.